When a company is as dedicated as this one to helping health caregivers improve patients’ lives, the mission starts where they work. In signature fast-turnaround fashion, Surface Solutions improves a new washroom in their Indianapolis location in just one day. 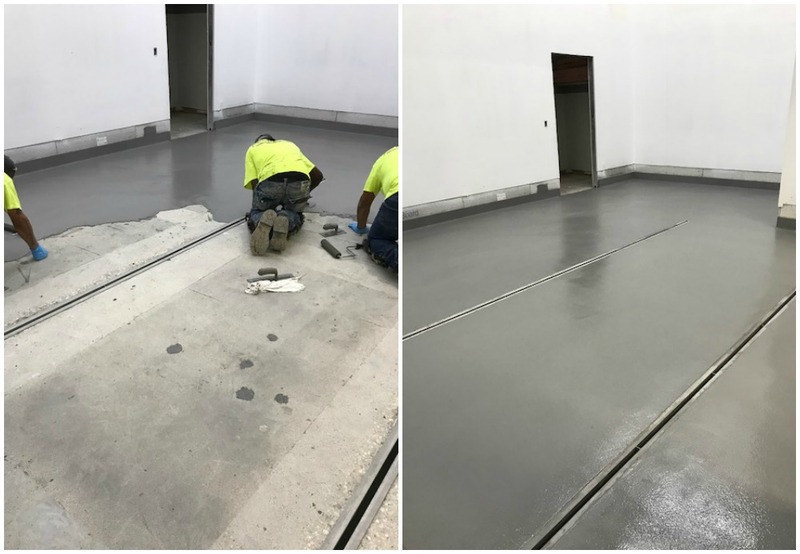 Using Ucrete RG, a durable polyurethane and concrete additive made specifically for this kind of job, our installation team forms a six-inch radius cove around the washroom and applies Ucrete UD200 to 950 square feet of bare concrete. This three-part urethane concrete flooring system is ideal for healthcare and pharmaceutical facilities because it is free of solvents, withstands extreme temperature fluctuations, is resistant to abrasion and impact and is slip resistant, even when wet. The result is a room where cleanliness and hygiene will meet government recommendations. Surface Solutions, Inc. stands behind our industrial floors, which are the foundation of your business. This goes for curbs and coving, too. Where the floor meets the wall – an area in any chemical, manufacturing or food processing plant as well as healthcare and pharmaceutical facilities that’s notoriously difficult to clean. The 90-degree corner that runs along the side of a room or around a column is also quite prone to bacterial contamination as a result. A cove, or coving –that part of a finished industrial flooring system that ends at floor edges and turns up to cover abutments in a room such as walls or columns, is ideal for smoothing over this gap, creating a seamless, impermeable transition between the floor and the wall. Easily cleaned, coving leaves dirt, dust and germs without a place to hide, helping to ensure a hygienic floor that meets every standard. Radius Cove. Hand troweled along the wall creating a radius between the floor and the wall. Applied at a 4- to 6-inch height and about a 1/8-inch depth. Cant Cove. Insures liquids do not sit at the base of the wall and floor. Applied at a 2- to 6-inch height and a 45-degree cant to the floor. Preformed Cove. A cove former supports the sheet at the floor and wall junction. Border Cove. Uses a separate piece of sheet material joined at the floor. For decoration; linoleum coving is generally installed in this way. Pencil Cove. Cove material is flashed up the wall, pushed into the junction between the wall and floor with a stair tool. For vinyl sheets with good flexibility. The recommended height for coving in washrooms, kitchens and food processing areas is from 3/16-inch to six inches. In meat and poultry manufacturing facilities, this could be raised up to 15 inches to avoid damage to the walls. Food and beverage facilities may find it useful to install coving behind stoves and food preparation benches to make these areas easier to clean. If the coving is made from the same material as the floor, installation is simpler, quicker and easier. “Not every industrial flooring installer is expert enough to trowel curbs and coving that’s 15 inches high,” says Amy Manghelli, President of Surface Solutions, Inc. “It takes a lot of skill, a lot of patience and a lot of strength, too, to get it to hang.” Surface Solutions has completed coving projects as high as six feet, across entire rooms. Whether it’s 3/16-inch, three feet or higher, the curbs and cant coves are built and completed first, then our installation specialists will lay the floor, integrating the floor and the cove together into a seamless, durable result. Coving can be added to existing flooring systems and is typically designed and installed based on appropriate use and function for your facility as part of a new flooring system, working around columns and other openings to provide the best functionality and appearance.